USD has been empowered after the US President Trump’s twitter feed against Amazon. Europeans are back to work after the long holiday which increases the demand for EUR. The support rests at 1.22900 with resistance at 1.23300 which both lines are below the weekly pivot point at 1.23590. The EMA of 10 is moving with bearish bias in the descendant channel and it is below the EMA of 200 and the EMA of 100. The RSI is rising towards the 50 level, the Stochastic is showing upward momentum and the MACD line is on the signal line in the neutral territory. The ADX is showing buy signal. 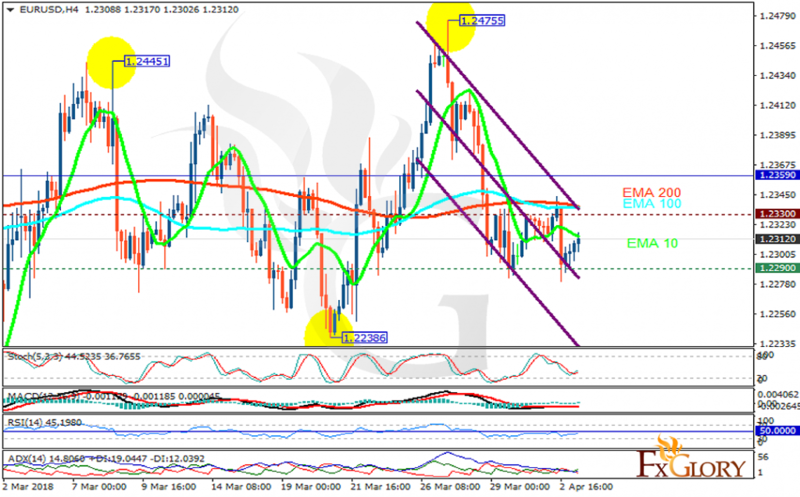 The support level breakthrough will drag the price down to 1.21 however, the indicators are showing upward trend therefore buyers can target 1.24.